After installing the files for Chinese support, there is at least one more thing to do before you can start typing Chinese. 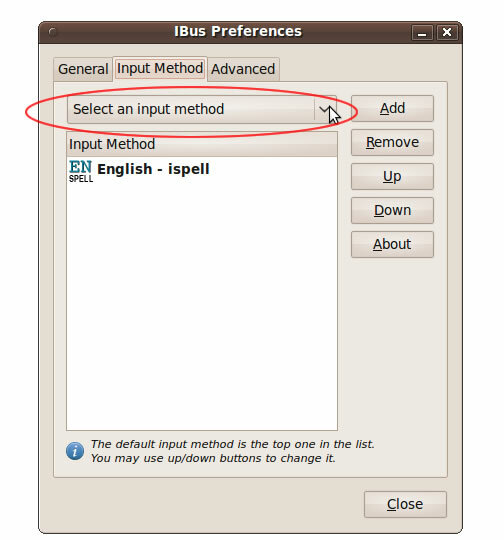 Ubuntu 9.10 has switched us to the IBus (Intelligent Input Bus) framework. According to the official announcement, IBus provides a "full featured and user friendly input method user interface" and is more flexible so it "also may help developers". But as at least one blogger named Samiux puts it, "IBus is not mature and complete, I choose SCIM instead". As for me, the Pinyin romanization-with-tone-marks input is a nice-to-have, but every time I look at the Pinyin input method that displays apostrophes (see below), I tend to agree with Samiux! Want to get your SCIM back? See my Ubuntu settings page for a link to Samiux's instructions. 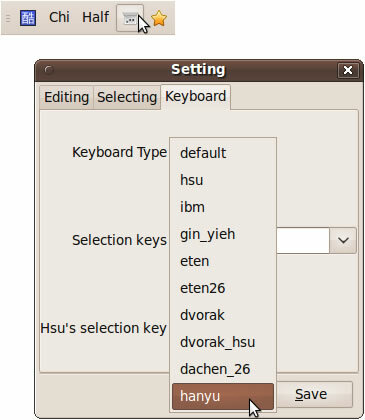 If you have Ubuntu 9.04, your default input methods are SCIM! To get the IBus keyboards to appear, do the following after installing the files for Chinese support (including selecting IBus in that little menu I showed you there). Now press the "Close" button. Please don't forget this next step every time you make a change in the Language panel: right-click on the keyboard icon and select "Restart". The keyboard disappears and reappears, and now we're ready to learn more about these input methods. If you try to left-click the keyboard icon without first opening something you can type into, it just says "No input window". A basic suite of applications from OpenOffice.org, also known as "OOo", is included with Ubuntu. When we installed Chinese features for Ubuntu all files required for OpenOffice.org Chinese support were also installed. Let's open OOo Writer and try those features out. OOo Asian language features are usually enabled by default after the installation. In earlier versions this was not the case, and you had to go to Tools > Options > Language Settings > Languages then click the box next to "Enabled for Asian languages". PinYin - Hanyu Pinyin and Shuangpin input, continuous, self-learning, GBK option, even English spelling lookup. pinyin - Pinyin romanization with tone marks (not Hanzi), for example type "pin1" and get "pīn". tonepy - Pinyin with tone number Hanzi input. Not continuous, no self-learning sort but useful as a backup. py - Hanyu Pinyin Hanzi input, with proportional/ monospaced Latin but not continuous, no self-learning. Chewing - Pinyin and Zhuyin/bopomofo input. Requires tone number for each character. Was also in 9.04/SCIM. bopomofo - a basic Zhuyin/bopomofo phonetic symbol keyboard, not an input method. Just for typing Zhuyin. More about how these input methods compare in a moment. First, let's select "PinYin" from the menu. (This is actually called "python PinYin" if you're ever looking for it as a separate download.) The language panel (a floating toolbar) will appear at the lower right of the screen, and you're ready to input Chinese! <Shift> will switch you between English mode and Chinese mode (equivalent to pressing the second button on the panel) and also switches the punctuation mode (fourth button) if it's originally set to Chinese punctuation. If you were accidentally pressing "Shift" and finding yourself in English mode, you can thank Xuan Luo for figuring out how to switch back! Other PinYin hotkeys (but not these unfortunately) can be turned on or off via the "i" button on the Language Panel. When using the Pinyin input method, Hanzi candidates will appear as you type. I did not type the apostrophes you see in the candidate list, I typed only "hanyupinyin" on the line where you now see Hanzi. The Pinyin with apostrophes appears automatically at the top of the candidate list. 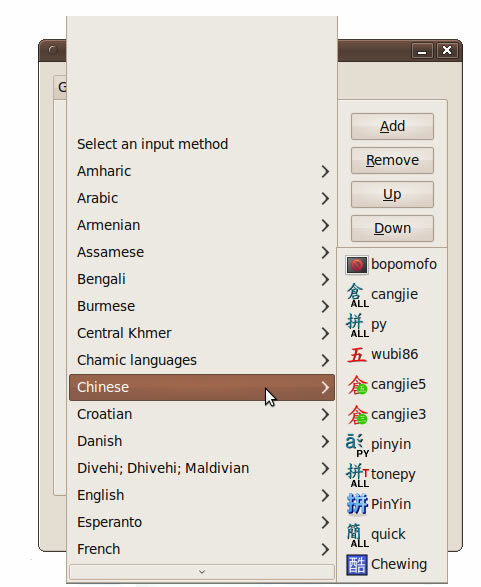 Why, I have to ask, do the Ubuntu Chinese input methods so often imitate only the worst features of other IMEs? Like Microsoft's SimpleFast, this implementation does not make the best use of the basic rules of Hanyu Pinyin for speed and accuracy! I'm told they're all copying the Sogou IME, which has a similar look and is very popular in the PRC, but IMHO apostrophes should be used only as as specified by the rules of Pinyin: to separate syllables when there might be some confusion (Xi'an vs. xian, fang'an vs. fan'gan, etc.) and nowhere else. Ditto for spaces between Pinyin sounds: Pinyin not pin yin. What was this developer thinking??? Why not imitate MS New Experience and the SCIM 智能拼音 (Smart Pinyin) IME? Maybe he/they have no idea: it's called "PinYin" after all, and the "y" should be lowercase. But what do I know? I'm just a foreign devil. Try asking the Father of Pinyin instead. Hanzi candidates will appear as you type. When character or phrase candidates appear, keep typing if they are OK (it guesses better as you complete cizu), then hit the spacebar on your keyboard to confirm your selection. To choose different candidates, type the number of a character or phrase in the list, press the down arrow to move to it on the list and hit spacebar, or click on it with your mouse. The candidates will automatically sort over time as the input method adapts to your frequency of usage. For simplified characters, PinYin (full name: "python Pinyin") is main phonetic input method. PinYin supports both Hanyu Pinyin and Shuangpin. It offers continuous input, self-learning (auto-sorting by your frequency of usage), and even an English spellcheck input. Unlike Smart Pinyin SCIM in 9.04, "PinYin" does not also support traditional characters well. [Update: this changed with Ubuntu 10.] Selecting the GBK option is not the same thing. You've already seen my rant above about the apostrophes and the capital "Y". [Update: that is also fixed in Ubuntu 10.] Those issues aside, this input method still has many rough edges and in fact the IBus framework overall is not entirely stable. But the other Pinyin-related "one-trick pony" simplified input methods like tonepy round out the features, and for most people this combination may be all they need. If you don't like this, you can always see my Ubuntu settings/preferences page for info on getting SCIM back. For traditional characters, Chewing is the phonetic input method. 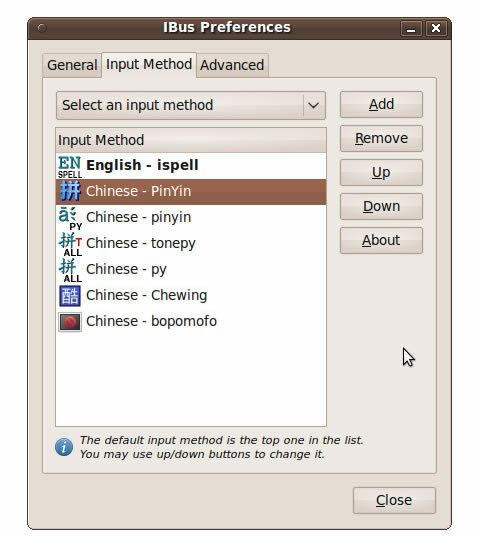 Chewing supports Pinyin and Zhuyin/Bopomofo - including Pinyin input with or without tone numbers - and also offers other input methods including the non-phonetic E-Ten (Yi Tian). "bopomofo", which I listed in the previous section, is not really an input method from the user perspective. It's more of a keyboard overlay allowing you to type the Zhuyin symbols alone. It's just a supplement to Chewing. Chewing is also in the SCIM framework used in Ubuntu 9.04, and previously I found this to be a mature, solid if less sophisticated implementation that works along the lines of the Microsoft New Phonetic IME. However in IBus Chewing is more unstable at this time. If you don't like IBus, I offer a link to info on getting SCIM back on my Ubuntu settings/preferences page.